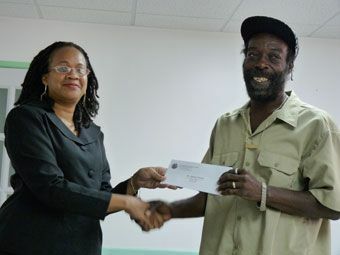 The other winners and participants in the competition also collected prizes during a prize-giving ceremony on Wednesday, March, 30, 2011, at the St. Vincent and the Grenadines Co-operative Credit Union Leagueâs Conference Room. Roger âDâLanlordâ Thompson who took the second place in the competition with his song âHandle with Careâ collected $4,000, and third placed Christopher Grant who sang âTake a Standâ, received $3,000. Duncan sang âProtect the Environmentâ. The other participants each received $1,000. The song competition, the second of its kind, is a part of the Projects Promotions Ltd (PPL) two-year project titled âCapacity Strengthening for Community Management of Resources for Sustainable Developmentâ funded by the Organization of the American States (OAS). A similar Junior competition was held in March of last year. Speaking at the prize-giving ceremony, Manager of Project Promotions Ltd. Cecil Ryan said that the project seeks to inform persons of how best to use their environmentsâ resources. Ryan stated that as a part of the project, they are working closely with the communities of Greiggs, Vermont, Spring Village and Chateaubelair to sensitize and encourage them about the preservation of the environment. Ryan also stated that the issue of preserving the environment has been the emphasis of a number of entities. He mentioned the RBTT Young Leaders focus on water preservation as well as other organizations who are becoming associated with the preservation of the environment. Also giving remarks, OAS representative Melene Glynn stated that the Project Promotions, having had two consecutive calypso competitions focused on environmental issues, has created a tradition of calling attention to Environmental Issues in March. Glynn added that since March is celebrated as National Heroes Month that environmental heroes can also be recognized. The overall aim of the project is to strengthen the basis for participatory and collaborative approaches to community development in the process of pursing alternative livelihoods, while addressing issues of gender, democracy and equality. Ryan also thanked the partners who lent their support to the Calypso Competition. They include the OAS, the Rawaccou Eco-Tourism Organisation, the Royal St. Vincent and the Grenadines Police Force, the International Airport Development Company, the Southeast Development Inc., the Carnival Development Committee and the SVG Calypsoniansâ Association.